Stop, Look, Listen! We often hear that in regard to what you should do when you approach a train track in your vehicle. Stop, look and listen for a train before driving over the tracks. I can remember when I was little and rode the school bus home, the bus driver even opened the door to the bus at train tracks so he could see better and hear any potential approaching train more clearly. But shouldn’t the same rules apply for pedestrians before they cross a busy city street? Should pedestrians also stop, look and listen for their own safety? Are they even required to do so? 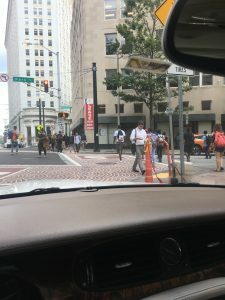 I drive down Edgewood Avenue in Downtown Atlanta to get from my house to my office every day. Edgewood is a busy city street that goes through the heart of Georgia State University. 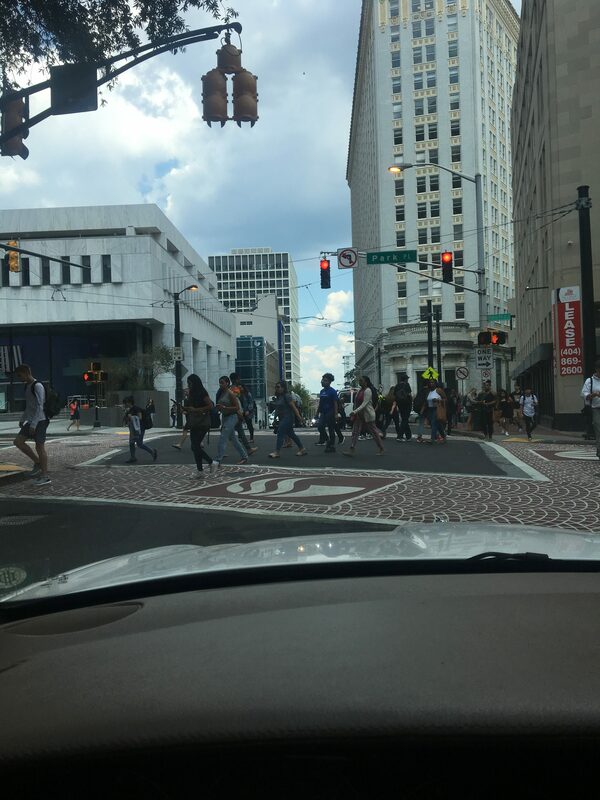 At any given time of the day, there are hundreds of college students crossing Edgewood Avenue to get to their next class to to their dorm room or maybe even to the library.l The three photos above demonstrate a typical day with GSU students crossing Edgewood Avenue. These photos show students crossing at the light, but students often cross Edgewood in the middle of the block, not at an intersection and without any traffic signal. Invariably, these young men and women are texting while walking, talking on their cell phones in deep conversations while walking, or even listening to something on their phones with earphones on while they cross one of the busiest streets in Downtown Atlanta. Many pedestrians attempt to cross while vehicle traffic has a green light. One of the photos above shows pedestrians crossing the street diagonally, which is certainly against the rules. Watching this sort of nonchalance and devil-may-care attitude regarding oncoming cars while they strut right out into the street had me wondering: who would be at fault if a pedestrian crossing illegally where struck by a car that had a green light? Does a person who texts while they cross a street value his or her life? Or does the lack of taking any safety precautions for their own person, e.g., not texting while walking, forfeit the right to blame someone else when they are struck by a vehicle? There is no question that texting while walking, especially while crossing a street, is a bad idea. 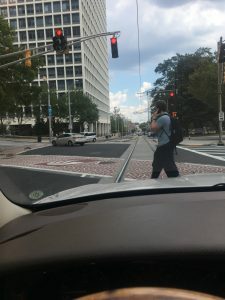 Research has found that, mile for mile, distracted walking results in more injuries than distracted driving, and makes pedestrians 60 percent more likely to veer off course. At least one city has taken the step to protect people from themselves. Starting Wednesday, texting while walking across a street in Honolulu is illegal, thanks to a new law that allows police to fine pedestrians up to $35 for checking their phone, while crossing an intersection in the Hawaiian city and surrounding county. Honolulu is, apparently, the first city in the U.S. and perhaps the world to ban texting while walking (TWW). “This is really milestone legislation that sets the bar high for safety,” said Brandon Elefante, a City Council member who proposed the bill, in an interview with the New York Times.